I’m just going to come right out and say it…this stuff is a godsend! My hands get really dry during the colder months and not even my favourite Clinique or Neom hand creams can save it, so i’ve turned to the power of plants with the Body Shop’s Hemp Hand Protector*. Now this one’s not going to win any prizes for best smelling beauty product on the market, but once you can get over the very ‘planty smell’ (scientific term) you’ll be well away as this hand cream has transformed my dry, cracked wintery hands into the soft supple ones i owned last summer! It’s a little on the oily side so i do find i need to wipe the palms of my hands on a tissue after application if i’ve squeezed out a bit too much but then don’t need to re-apply for hours – it’s just brilliant at replenishing moisture instantly and curing even the driest of skin. My cuticles love it too making it a perfect all in one product to throw in my handbag or keep on my desk at work. At £10 for this 100ml tube (£5 for 30ml) it’s about middle of the range, but the cream itself is so thick you only need a smidgen each time you apply – which isn’t that often at all. It’s the perfect product for men and women alike but i’d strongly recommend sniffing it in store before buying in case you’re not a fan of the smell. It’s not your usual ‘pretty hand cream’ but it really has saved my hands this winter and i can’t rave about it enough! 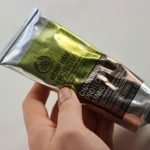 You can find The Body Shop’s Hemp Hand Protector on their website HERE from just £5! Have you tried this hand cream before? Are you a lover or a hater?